Besides lip balm, the one thing I never leave the house without hand cream. No matter how tiny the bag, and trust me they get tiny, there will always be hand cream in there. I get extremely dry hands and lips during the winter. They turn this disgusting shade of grey, not really painting a pretty picture, I know. But it's the truth. Regularly massaging your hands with a gorgeous smelling cream is a simple fix that is actually quite enjoyable. There's quite a collection piling up on my vanity, and I decided to share my moisture infusing hand products on here. 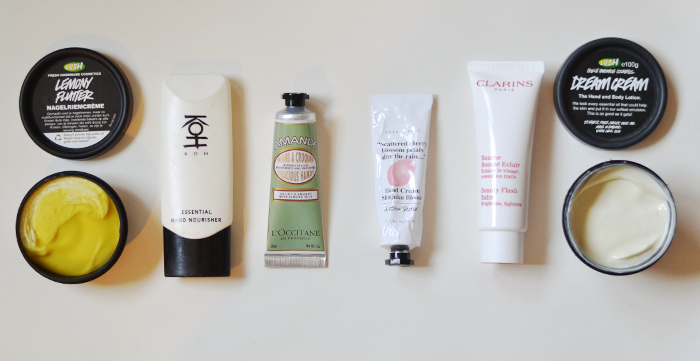 From left to right we're starting with a product that isn't even a hand cream, it's a cuticle butter. It's a product I cannot go without Lush Lemony Flutter because it smells absolutely delicious and it's the only thing that keeps my disgusting cuticles in check. I get acrylic nails once a month, and that really does a number on my cuticles. When using this they stay in one piece, no cracked painful bits and they're lovely and soft. One of the most expensive hand creams I ever bought is from KOH. I got a small sample of this in a beautybox and fell in love with the immediate softening effect this had on my skin. It absorbed super fast and didn't leave my hands feeling greasy at all. Want something lush and amazing, then L'Occitane is definitely the brand for you. Their hand creams are amazing, and after finishing a tube of their honey hand cream to the last drop, I'm now using their almond version. This smells really good and it moisturizes in seconds, and just like the KOH cream this doesn't leave any sticky or greasy residue. A souvenir from Paris and quite possibly the girliest smelling hand cream I will ever use is the Shinjuku Bloom hand cream from & Other Stories. Honestly, I bought this because of the packaging. I have a weakness for simple packaging, and the white metal tube with a subtle pink smear immediately won me over. It took quite some self restraint to just buy one. It isn't the best moisturizer, but it's a quick fix to aid dry hands. And it's totally affordable. The Clarins Beauty Flash Balm doesn't have hand cream listed among it general description, but one day when I had stupidly forgotten to bring a hand cream I used this for some much needed relief and was really impressed. This instantly relieved the dry tight feeling my hands were having and at that it totally brightened my hands. They looked super healthy and if I'd just had a wonderful manicure and massage. I don't use it regularly, but I do reach for it when my hands need more than a little moisture. The last one is really good in the moisture department but the smell is a love it or hate it type of deal. And I am definitely on the 'hate' side of things with this. Seriously, the cream smells terrible to me. Which is really sad because I love what it does for my hands. I'm talking about the Lush Dream Cream. My solution for smell issue is apply this, put on some cotton gloves and go to bed. I do not wear this during the day. That's it, my must have hand creams. In my opinion, an essential that you must always carry around with you. At least, it is for me.